So there's a few observations to make about this history. First, Halloween 2018 was the first year I spent the entire day (and thus, the first year I spent Halloween evening) at home in Seattle since 2002. The reason I did not travel in 2002 was because I simply could not afford to. That day would have been five days shy of three months into my job at PCC, which had followed roughly three months of temp work, which in turn had followed maybe four and a half months of outright unemployment -- a stretch of time in my life truly unlike any other. I just didn't have the money to take a train or a Greyhound to Olympia. Although looking back now, I wonder if public transit had the same options then as it does now, allowing for three-hour bus trips at the cost of only a few bucks? I actually have no idea. I feel like there's just as much possibility there was as there wasn't, but either way, I don't think it ever occurred to me back then -- four years into my living in Seattle -- even to wonder if it could be done. At the time, in my mind public transit agencies were exclusive to their home cities. I've learned a lot since then! My not going to Olympia this year really has nothing to do with being broke. I am far from broke, even though Shobhit's and my combined income is currently way lower than it was during his years as a (far less happy) Program Manager. It's really because of two things: much as I would have liked to go to Olympia, it has been several years since Dad and Sherri did their traditional "Halloween Open House" that effectively turned it into a regular family holiday (all asterisked lines above indicate having attended said Open House -- the last one I attended was in 2013); and perhaps most pertinently Halloween fell on a Wednesday. Even though apparently Britini did tell Dad "Well I'm coming over! ", taking today off like I typically did in the past so I could stay overnight, especially when Shobhit was particularly uninterested in that, was a lot to do for what amounted to not much. Even last year's visit to Olympia was the least eventful of any Halloween trip there before, but I went anyway because Shobhit was in India at that time and I wanted to do something. That said, the final result was to make Halloween evening itself the dullest I have had since . . . honestly, the mid-nineties: the beginning of that listed history. It might actually have been more fun to go to Olympia after all, in retrospect. Even in 2002 I dressed up (as "Jesus on Acid" -- the history of my costumes is also noted on that page of Halloween photo set collections on Flickr) and went out for dinner, with Andrea, Walt, Barbara and a few of their other friends. If I remember right, that was an annual tradition of theirs. I wonder if it still is? On the other hand, Ivan is visiting this week, and being home for his arrival last night certainly did make it easier. Perhaps I shall make more of an effort next year to come up with something more exciting -- and certainly photogenic -- to do Halloween evening, assuming we again won't go to Olympia. Indeed, as time goes on an people get older, we're bound to have to come up with some new traditions of our own. Halloween Carnaval in West Hollywood is a huge event, some half a million people packed into a blocked-off half-mile of Santa Monica Boulevard, and it kind of became a new tradition for Shobhit and me, having gone there with him four times in the five years between 2012 and 2016. That did grow kind of tiresome, though, as it was just too crowded, and by our fourth one even then I was getting the attitude that I was finally over it. None of this is to say yesterday wasn't fun at all, however. 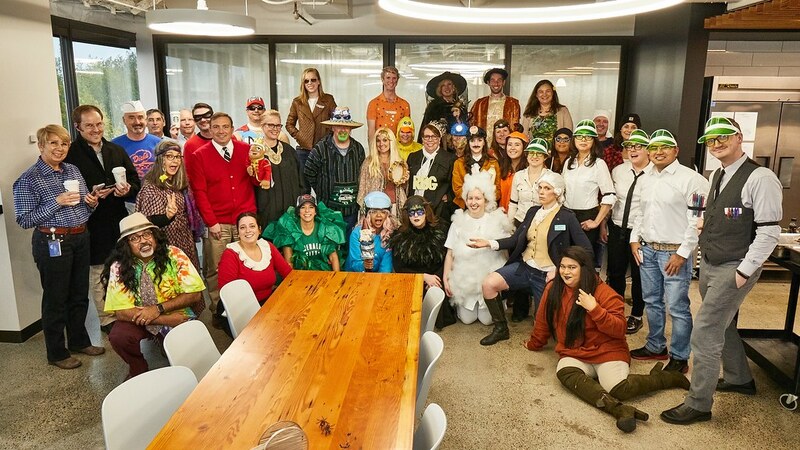 It was lots of fun -- just confined pretty much exclusively to work, which is wholly new to my personal Halloween history. I also have a "Halloween at PCC" collection of photo sets, dating back to 2004; for the six years between 2005 and 2010, us three "Merchandising Asses" (Merchandising Assistants, first grouping myself with Kibby and Shauna the first three of those years; then with Kibby and Jared) coming up with themed costumes for the three of us each year. These were sometimes very work specific, and almost all of them distinct from whatever I dressed up as on Halloween evening, which is why I don't include them in my "History of Matthew's Halloween Costumes" photo set (that one now covering 23 years, 1987 and then every year 1997-2018), as I basically think of what I dressed up every Halloween evening as "Halloween costume canon." Things have shifted the past couple of years, of course, what with my now having two different days to wear the year's costume, which I no longer have any interest in varying within the same year: Jennifer and Eric's Halloween Party (which I see Dad and Sherri at anyway, and effectively replaces what used to be their Open House on Halloween night); then Halloween day itself. As it happens, even having gone to Olympia last year, I really didn't dress in costume at the house, and neither did anyone else. (I really only managed to pad last year's photo set to 41 shots by combining the PCC photos and the Olympia photos into one set, which I had kept separate in the past; and also taking several extra photos on the trip home from Olympia the next day.) The point being, both last year and this year, on Halloween day itself, I only had a costume at work. So now to shift the focus to work, as has been the trajectory in this post all along! That collection of photo sets for Halloween at PCC that dates back to 2004, has a big gap in it: no sets at all between 2011 and 2016, as I did not come to work on Halloween day at all in any of those years. In 2011, Shobhit, visiting from L.A., and I took the train down earlier in the day and then stayed the night, taking the train back the next day. In 2013, I had just finished that month's visit with Shobhit in L.A., which allowed me to spend his birthday with him on the 30th, and on the same day at the end of it, Shobhit flew to visit his mother in India, and I flew from L.A. to SeaTac. Instead of busing home from there as usual, I bused directly to Olympia for that year's visit for Halloween. The rest of those non-PCC years, though -- 2012; 2014; 2015; 2016 -- were spent in L.A. for the West Hollywood Halloween Carnaval. 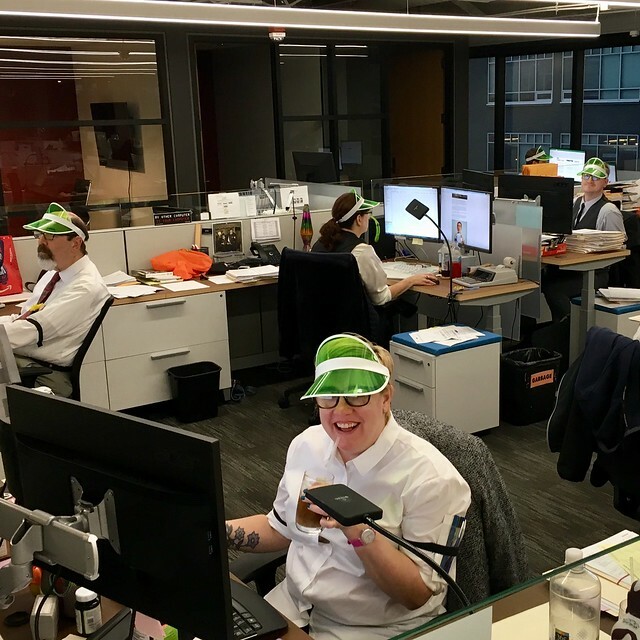 So, last year was my first year spending Halloween at work since 2010. As I said, in years past I separated PCC Halloween photo sets from Halloween evening sets, just so the sets would not be too large. Last year and this year, I still have separate sets for PCC-only shots, for consistency with that "Halloween at PCC" history -- but, those very same photos are included in the photo sets I have also for Halloween day. Otherwise, the set for last year, excluding PCC photos, would have had only 25 shots (and, more importantly, none of them featuring anyone in costume); this year's would have been only 10. Because, of the 35 shots I have in yesterday's Halloween photo set, 25 of them were taken at work -- actually a record high for PCC-specific Halloween photo sets. Only 2009, at 23 shots, ever came close. As you can see, I once again wore the "Be the Change" costume I had done for Jennifer and Eric's Halloween party -- for the second year in a row, the best photo taken of my costume was actually taken at that party rather than on Halloween day itself. I'm actually pretty pleased with this year's costume, an idea I'd had in the back of my mind for a while but was unsure how easily it could be pulled off; it was not until going to Joann's Fabrics with Shobhit the day before the party that I found the double-sided fabric tape and discovered how easy it would be. "Easy" is somewhat relative, I suppose -- this was still time-intensive, and probably took at least an hour to tape and affix the $10 worth of coins I had all over my body, both times. And as of right now, although I do have all the coins off that shirt, probably a quarter of the coins still need to have the tape scraped off, and that takes longer than putting them on did. The tape doesn’t quite come off like regular tape, although sometimes it sort of does, if I manage to get the scraping started just right, can grab the tape just right, and can pull it off just right. Lynne was herself dressed as a witch, with two giant spiders, one of them remote control (the subject of the one video clip I took yesterday, stupidly recorded as vertical video, which annoys me to no end), and she declared herself "Queen of the Spiders." I suppose more accurately she was the Witch Queen of the Spiders. The one other person I took the most photos of was Lamai, seen in the photo above with me, when Helen had come over and offered to get our picture together. She was dressed as Ali Wong from her "Hard Knock Wife" comedy special. Ali Wong was very pregnant in both her last two comedy specials, the first of which having catapulted her to comedy fame, and to my surprise, Scott recognized her immediately. Lamai was still around the corner but Scott could see her from his desk, and he said, "Are you 'Baby Cobra'?" -- Baby Cobra having been the name of Ali Wong's first special. 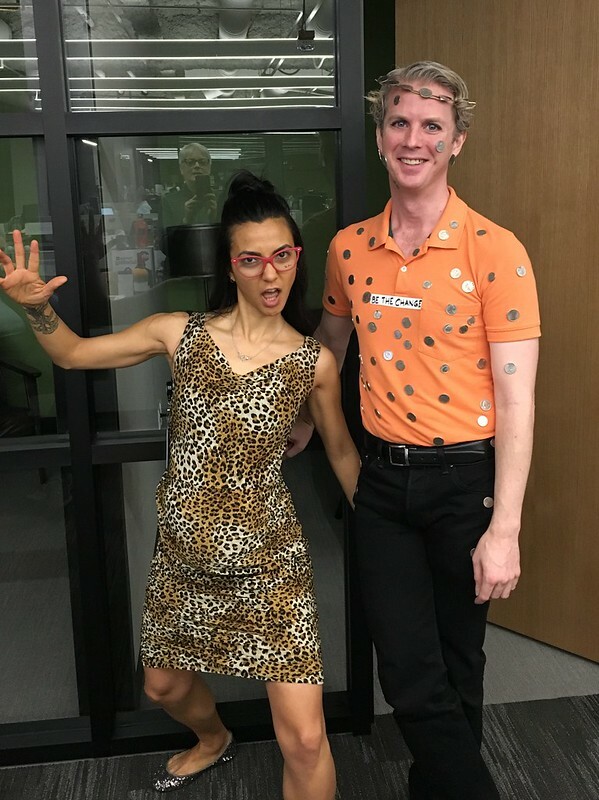 I told Scott I was surprised he even knew who she was (and I knew not everyone in the office would, so to many sets of eyes Lamai would just look like she was dressed as a pregnant lady in a leopard print dress). It never occurred to me that he would be into her kind of humor, let alone into standup comedy at all. Scott's response? "The dirtier the better!" Well, okay then! At the bottom of this entry you'll see the group shot that was taken of all the people who could gather at 2 pm -- this excluded Lamai, who'd had to leave earlier; and for some reason the new-ish guy in the Social & Environmental Responsibility department, Brent, who had a pretty great Pinocchio costume on. In spite of those absences, this photo contains thirty-nine people -- more than double the group shot from last year, which had 18. This year's group shot is a truly spectacular photo, and I love many of the poses in it -- Arvin on the floor; Jess to his right as "Jorts Washington"; Claudia as the rather esoteric but still fabulous looking "Apple" from the cult movie Turbo Kid (which, apparently, I need to see); further to the left you can see Will, VP of IT, dressed perfectly as Mr. Rogers, complete with hand puppet. I worked the regular work day as usual, although I use the word "work" loosely -- I got some stuff done, but not a whole lot; as you can imagine, there was a lot of distractions yesterday, not least of which was the bowl of chocolate candies I could not keep my hands out of. In years past, there was chocolate candy left out for people all month (this used to be done by Kim A, who recently passed away, with a bowl of candy at her cubicle). I'm really glad it's now just the one day. I was lucky it was not raining while I walked home. I forgot my umbrella at the bus stop Tuesday morning and so I had to stop at Bartell Drugs on my walk home yesterday and buy a new one. I was glad to have it handy when Shobhit and I went for a walk to the north end of Broadway and back later in the evening. I thought maybe I could find a few things to get pictures of, being Halloween night, but all the walk yielded was about six new photos (better than none, I guess! ), two of them even vaguely related to Halloween. Presumably it would have been much different had we taken this walk on Saturday night, as the clubs always have their big Halloween parties the previous weekend. We did pass several people in costumes, to be fair; not many of them were worth going out of my way to get pictures of, though. Shobhit and I did go over and check out the new Whole Foods on Broadway and Madison, though, which was more interesting than I expected. The layout of the Whole Foods on Denny and Westlake is perpetually confusing; this one, with its Beer and Wine, Hot Bar and Deli sections all up on a second floor, is much more nicely straightforward. I pass that corner semi-regularly and may go in there from time to time now. The place had just opened on Tuesday, and it was not particularly busy on the day we went in. We walked home and I spent the rest of the evening either working on editing and uploading photos, including the first-ever photo digest email sent from my personal gmail account rather than my work account, after some dipshit at work forwarded what I had sent to Ricardo, not knowing he'd been laid off, to a higher-up and asking if it was "the best use of company time." (Never mind that I usually wrote drafts at home first and then emailed them to myself at work, but, whatever.) I suppose this is better regardless, but my list of email contacts for distributing these emails was in a Word document I saved to Dropbox, and trying to copy and paste what would format perfectly fine in Outlook email into the BCC line in a Gmail draft proved annoyingly messy. I had to copy and paste a few dozen separate emails one by one before I could finally send it; it took some time for the photos to embed-attach correctly; and then two of them bounced back because I the copy/past process hadn't done right. I re-sent to those two people this morning. Anyway, the walk was after Ivan arrived. I have no idea what he'd been doing all day, as he said his arrival to Seattle would be around 11 am, but he got to the condo building probably just a bit past 6:00. He must have looked up Shobhit's name on the intercom instead of texting me, because it rang to Shobhit's phone, and Shobhit buzzed him in. Shobhit and I were in the middle of preparing dinner, and asked if he was hungry; he said he was not, as he already ate. He opened the bit of mail he had at our place -- including a box of tarot cards he was strangely eager to show me -- and chatted with us for a few minutes as he settled in. Then he said, "If you don't mind I'm going to go lay down for a bit. I'm sleep deprived." I told him, "I suspected you might." He works nights, and if he took the bus in the morning, surely he hadn't gotten any sleep yet. He only stayed in the guest room for about an hour before he was up again, though. He was then off to a Halloween show of some kind in West Hollywood, which he said he goes to every year. So, he wasn't even around during Shobhit's and my walk around Capitol Hill, and he returned shortly after I went to bed. I'll get to see much more of him this evening, as we have 5 pm reservations at Neko Cat Café; and definitely tomorrow evening, which will be spend first at dinner at The Marrakesh, then seeing the remake of Suspiria. He goes back to Bellingham Saturday morning, which works out because I'll be spending the day with Danielle and a work friend of hers that day.